Pakistan rode on blistering half-centuries by Kamran Akmal (50) and Umar Akmal (56) to post a challenging 191 for six against Australia in the second semi-finals of the Twenty20 World Cup on Friday. provided the late charge as Pakistan stunned Australia with their stroke-play in a sticky Beausejour wicket in St Lucia. 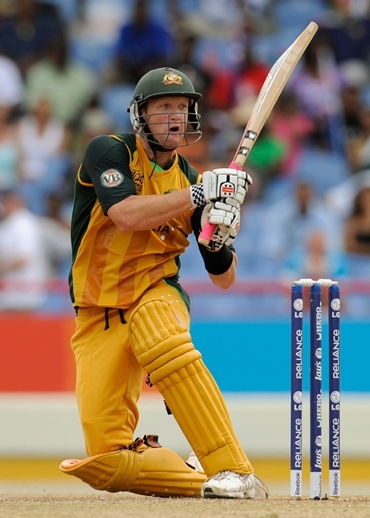 Australia, after a bad start, chased down the target and beat the defending champions by three wickets. They will take on England in Sunday's final. Inclement weather and wet ground conditions delayed the start of the match by half an hour, but that did not bother the Pakistan openers as they went about their business. 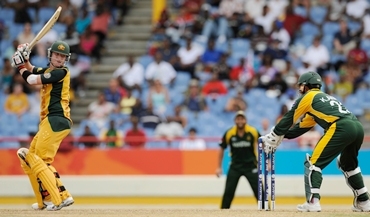 Umar Akmal, like his brother, keep a cool head and went hammer and tongs atthe Aussie bowolers. He remained unbeaten, his 35-ball knock inclusive of two hits to the fence and four huge ones over it as Pakistan scored a whopping 73 runs off their final five overs. If the Australians had expected the holders to capitulate -- considering the latter's woeful run against them in recent times -- they were in for a shock, as Pakistan retaliated magnificently. And that left the team from Down Under, unbeaten in five matches in the tournament, shell-shocked. The in-form Dirk Nannes conceded no run in the opening over, but then went for plenty -- conceeding 32 runs in his four over for the reward of one wicket. Australia got off to a disastrous start as David Warner (0) hit the second ball of the innings - bowled by Mohammed Aamer straight to Umar Akmal at backward point. Shane Watson (16) eased the pressure first with a boundary off Aamer followed by maximum off Abdul Razaaq, both the shots directed towards the midwicket. He then smashed the first ball of the third over straight past the bowler for yet another boundary before Aamer struck back two balls later, having the batsman caught by Abdur Rahman at long-on. Australia had thus lost both their openers inside the first three overs and had a mountain to climb. Brad Haddin (25) came in at the fall of Warner's wicket and hit Razzaq for two boundaries in the three deliveries, the first through cover and the second between the bowler and the mid-off. He welcomed spinner Abdur Rehman with a six over the backward square leg boundary. However, the spinner had the last laugh when he had Haddin stumped in his second over. David Hussey (13) and Cameron White (43) put on 43 runs (off just 25 balls) for the fifth wicket to stabilise the Australian innings to an extent. White hit successive sixes off Afridi and yet another one over cover boundary off Mohammad Hafeez. Hussey also hoisted Hafeez long-off for a maximum but perished in his bid to accelerate, hitting a Rehman delivery straight back to the bowler. Australia needed 70 off their final five overs with five wickets left - being 122 for five as opposed to Pakistan's 118 for three at that stage. However, the dismissal of White in the 17th over - caught by Hafeez at long-off - almost ended all hopes of an improbable win. White's entertaining 31-ball knock was inclusive of five huge hits to the fence. Australia needed 18 off the final over - to be bowled by Ajmal. And in what was a commanding batting display in those last six deliveries - Mike Hussey smashed 22 runs off four balls to take his team home. 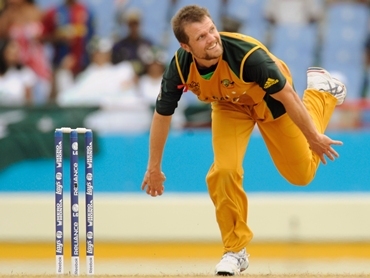 The sequence read 6, 6, 4, 6 and Australia were through to the final with a ball to spare. Hussey was unbeaten on 60 off 24 ball, including three fours and six sixes.